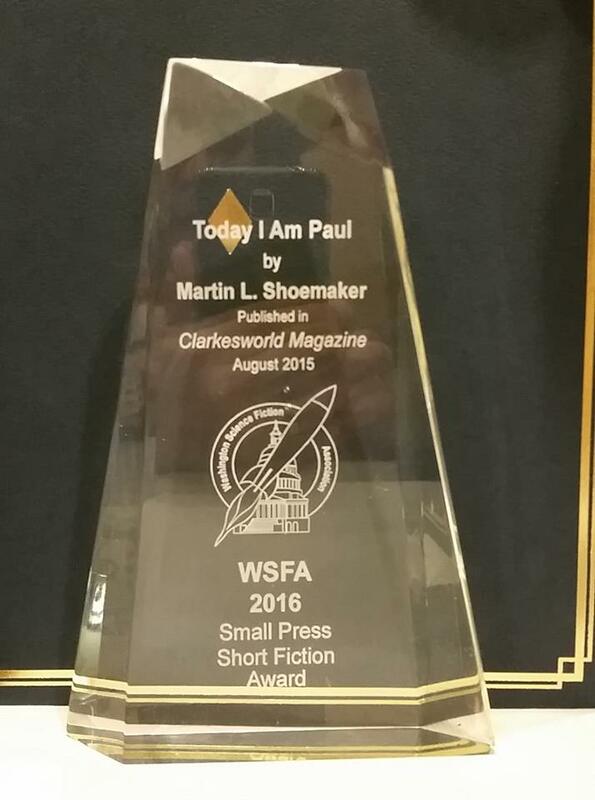 This weekend, the WSFA Small Press Award winner was announced at Capclave. We had three stories on the ballot (“Cat Pictures Please” by Naomi Kritzer, “The Empress in all Her Glory” by Robert Reed, and “Today I am Paul” by Martin L. Shoemaker) and a long history of other finalists since this award first launched. On several occasions, it has been joked that we are the Susan Lucci of this Award… many nominations, but never a win. Sadly, Naomi, Robert, and Martin were not able to attend. I have a small stack of unread acceptance speeches from our prior finalists, but nothing in hand from this year’s crew. Naturally, this was realized just before dinner that evening–the award ceremony was to follow–, so I came up with a quick emergency plan. I then read a slightly reworded version of the first paragraph of her acceptance speech and then went on to say that in all seriousness, thank you. I know that Martin would have liked to have been there, but the cost of travel being what it was, etc. Instead he was at a convention more local to him that weekend. I mentioned that I knew the story was very personal to Martin and that this award would mean a great deal to him. I forget what else I said, as is typical to these moments. At one point, the crowd mentioned I should call him, but I didn’t have his number, so we took pictures instead. The audience cheered while I took their picture, then had me capture shots of the screen and, for some reason, the ceiling. I then retreated to the sidelines to try to reach Martin by email and Twitter. The actual award showed up later, so I took pictures of that and his certificate as well. After I noticed he surfaced on Facebook, I posted photos to his wall for all to see. I couldn’t be happier for Martin. Aside from publishing it in Clarkesworld, I made it the lead story in the first volume of Best Science Fiction of the Year. It’s an amazing tale and as I mentioned, a personal–and very moving–one to boot. If you ever have the chance to hear him read it, do so. By the way, later Martin asked if I started the speech with “Today I am Martin.” That’s why he’s the writer and I am not. Wish I had thought of that one! Here’s a photo of the actual award. They give one to the publisher and one to the author–which I think is a really nice gesture on their part–so I’ll have one on my shelf too. I’ll be sending Martin his when the post office reopens tomorrow. Which science fiction inventions haven’t arrived yet that you wish would hurry up and get here? Which SF future would you most like to see before you die? Which SF future are you most relieved has NOT come to pass? A big congratulations to Naomi, Martin, and Robert. Will one of them be the first to take home this award for Clarkesworld? We’ll find out at Capclave! 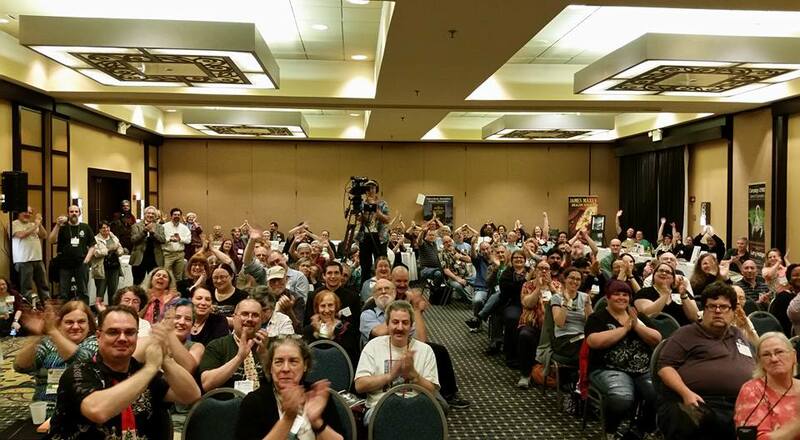 I’ll be attending Midamericon II (Worldcon) from August 18th through 21st. Here’s my current list of signings, panels, and award ceremonies I’ll be attending. I was originally scheduled to have a Literary Beer, but the time they assigned me didn’t work. I can’t say that they’ll be able to reschedule, so if you planned on going to that, please feel free to catch me after a panel, as I wander the con, or even at the Clarkesworld at Ten panel. Any writer or editor can tell you that writing a short story and writing a novel require different skills in the writer’s wheelhouse. Writing on the small scale requires precision of detail from concept to completion. What do you need to know about openings, character development, narrative arcs, endings, and more that will make your short fiction pop? How does the process differ from putting the initial draft on paper to editing the text to better reflect the vision in your head? When do you know when that short story is finally ready to go? Ceremony held by the the Association of Science Fiction and Fantasy Artists to recognize individual artistic works and achievements. Join us as we honor the winners of the John W. Campbell Memorial Award for best science fiction novel of the year and the Theodore Sturgeon Memorial Award for the best science fiction short story of the year. These awards are unique in that they are selected by incredibly well read authors and scholars in the field. This process side-steps the politics of other award methods. Tonight we will announce the winners and honor their talent with a brief reception. A lot of things have changed for magazine publshing. What’s the beat way in, and how do we write for a genre that is moving across media? More than just the magazines, short fiction is in a golden age, found in the magazine, online, in anthologies, and chapbooks. The field’s editors come together to talk about what they are seeing, and debate whether there is a short fiction renaissance. Our Magazine Group Reading Series continues with a special group reading that features authors from Clarkesworld Magazine. Rather than failing, bookshops are allegedly on the rise, but is this the case for all kinds or just a special few? Current and former bookstore managers, owners and users discuss the realities of selling books in an online and e-book world. Neil Clarke began publishing Clarkesworld Magazine in October 2006. He, his staff, and some contributors look back on ten years. The big secret to getting a short story accepted is to write an amazing story. But are there simple things an author can do to make sure their story isn’t dismissed out of hand? We’ll also look at some of the best techniques for finding the right market to submit your work and for tracking your submissions. The annual and most prestigious science fiction awards ceremony comes to Kansas City. By the way, Clarkesworld was founded at Readercon ten years ago. We didn’t manage to get a celebratory group reading onto the schedule, but a number of our authors are scheduled for their own readings. Check them out!